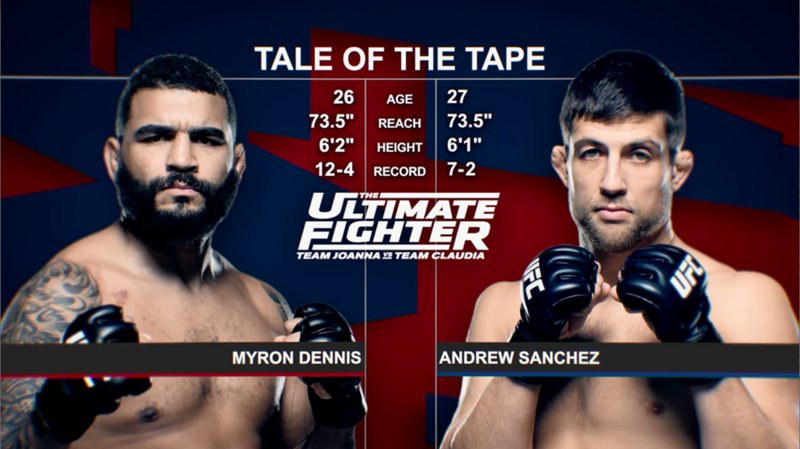 Andrew Sanchez vs Eric Spicely TUF 23: Team Joanna vs Team Claudia Jun 22, 2016 (4:35) Andrew Sanchez vs Eric Spicely from episode ten of The Ultimate Fighter 23: Team Joanna vs Team Claudia from 2016. 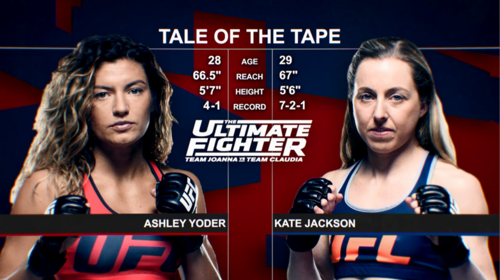 Kate Jackson vs Ashley Yoder TUF 23: Team Joanna vs Team Claudia Jun 15, 2016 (14:58) Kate Jackson vs Ashley Yoder from episode nine of The Ultimate Fighter 23: Team Joanna vs Team Claudia from 2016. 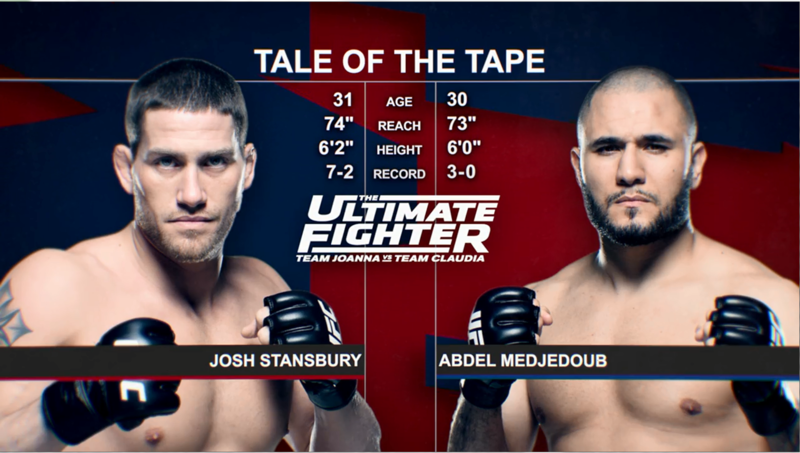 Josh Stansbury vs Abdel Medjedoub TUF 23: Team Joanna vs Team Claudia Jun 8, 2016 (15:04) Josh Stansbury vs Abdel Medjedoub from episode eight of The Ultimate Fighter 23: Team Joanna vs Team Claudia from 2016. 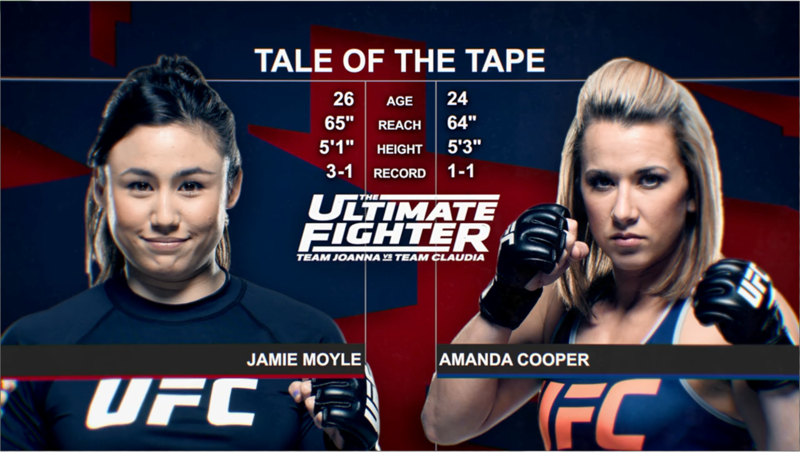 Amanda Cooper vs Jamie Moyle TUF 23: Team Joanna vs Team Claudia Jun 1, 2016 (15:25) Amanda Cooper vs Jamie Moyle from episode seven of The Ultimate Fighter 23: Team Joanna vs Team Claudia from 2016. Khalil Rountree vs Josh Stansbury TUF 23: Team Joanna vs Team Claudia Jul 6, 2016 (7:58) Khalil Rountree vs Josh Stansbury from episode twelve of The Ultimate Fighter 23: Team Joanna vs Team Claudia from 2016. Ashley Yoder vs Jodie Esquibel TUF 23: Team Joanna vs Team Claudia Apr 20, 2016 (8:08) Ashley Yoder vs Jodie Esquibel from episode one of The Ultimate Fighter 23: Team Joanna vs Team Claudia from 2016. Myron Dennis vs Jamelle Jones TUF 23: Team Joanna vs Team Claudia Apr 20, 2016 (5:46) Myron Dennis vs Jamelle Jones from episode one of The Ultimate Fighter 23: Team Joanna vs Team Claudia from 2016. Amanda Cooper vs Lanchana Green TUF 23: Team Joanna vs Team Claudia Jun 29, 2016 (9:02) Amanda Cooper vs Lanchana Green from episode eleven of The Ultimate Fighter 23: Team Joanna vs Team Claudia from 2016. 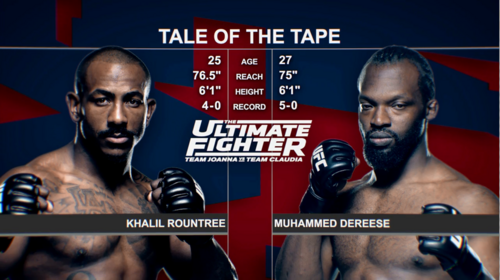 Khalil Rountree vs Muhammed Dereese TUF 23: Team Joanna vs Team Claudia Apr 20, 2016 (6:39) Khalil Rountree vs Muhammed Dereese from episode one of The Ultimate Fighter 23: Team Joanna vs Team Claudia from 2016. Lanchana Green vs Ashley Cummins TUF 23: Team Joanna vs Team Claudia Apr 20, 2016 (8:47) Lanchana Green vs Ashley Cummins from episode one of The Ultimate Fighter 23: Team Joanna vs Team Claudia from 2016. Eric Spicely vs Kenneth Bergh TUF 23: Team Joanna vs Team Claudia Apr 20, 2016 (2:07) Eric Spicely vs Kenneth Bergh from episode one of The Ultimate Fighter 23: Team Joanna vs Team Claudia from 2016. Amanda Cooper vs Mellony Geugjes TUF 23: Team Joanna vs Team Claudia Apr 20, 2016 (2:48) Amanda Cooper vs Mellony Geugjes from episode one of The Ultimate Fighter 23: Team Joanna vs Team Claudia from 2016. Abdel Medjedoub vs John Paul Elias TUF 23: Team Joanna vs Team Claudia Apr 20, 2016 (2:11) Abdel Medjedoub vs John Paul Elias from episode one of The Ultimate Fighter 23: Team Joanna vs Team Claudia from 2016. 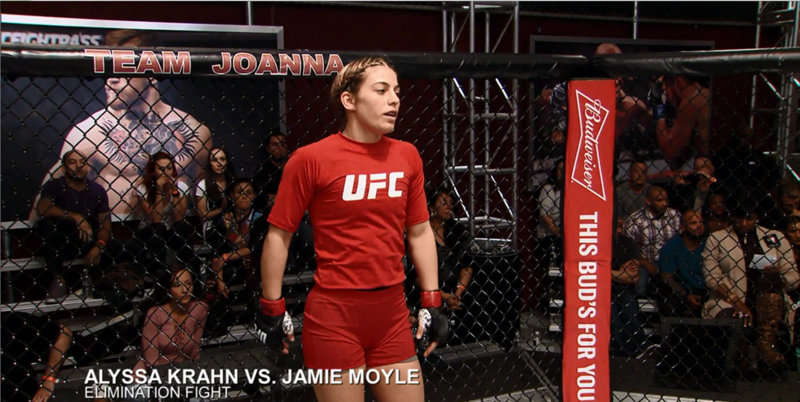 Jamie Moyle vs Alyssa Krahn TUF 23: Team Joanna vs Team Claudia Apr 20, 2016 (6:16) Jamie Moyle vs Alyssa Krahn from episode one of The Ultimate Fighter 23: Team Joanna vs Team Claudia from 2016. 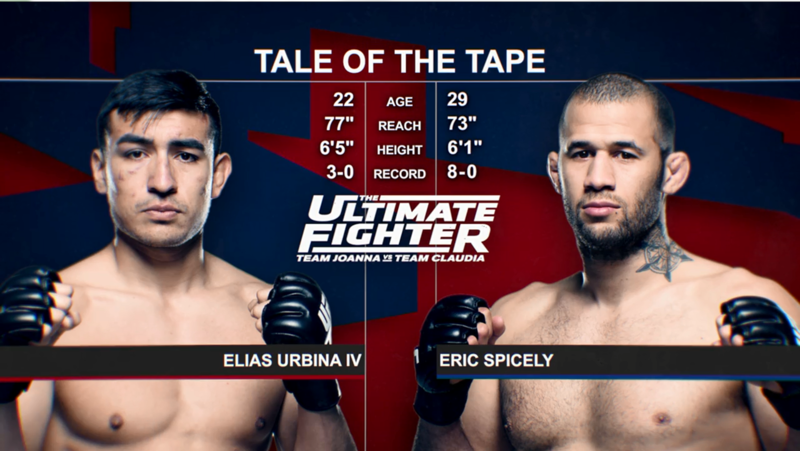 Eric Spicely vs Elias Urbina TUF 23: Team Joanna vs Team Claudia May 25, 2016 (14:18) Eric Spicely vs Elias Urbina from episode six of The Ultimate Fighter 23: Team Joanna vs Team Claudia from 2016. Lanchana Green vs Helen Harper TUF 23: Team Joanna vs Team Claudia May 18, 2016 (20:17) Lanchana Green vs Helen Harper from episode five of The Ultimate Fighter 23: Team Joanna vs Team Claudia from 2016. 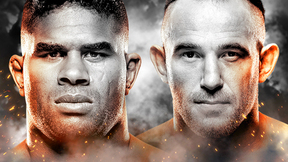 Andrew Sanchez vs Myron Dennis TUF 23: Team Joanna vs Team Claudia May 11, 2016 (13:57) Andrew Sanchez vs Myron Dennis from episode four of The Ultimate Fighter 23: Team Joanna vs Team Claudia from 2016. 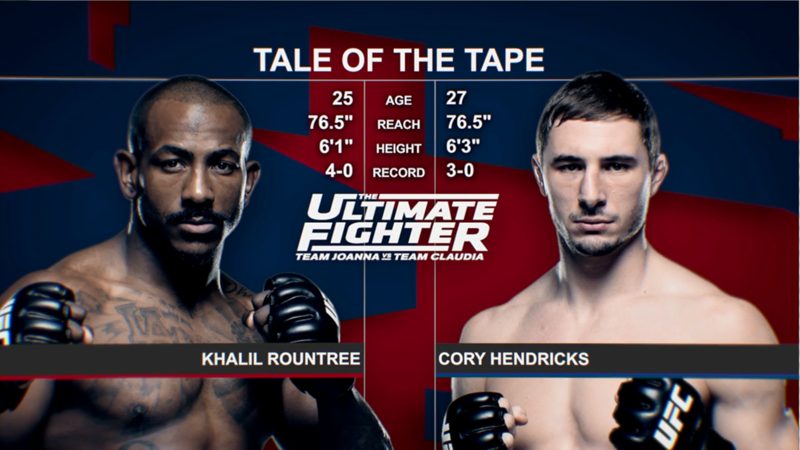 Cory Hendricks vs Khalil Rountree TUF 23: Team Joanna vs Team Claudia Apr 27, 2016 (5:33) Cory Hendricks vs Khalil Rountree from episode two of The Ultimate Fighter 23: Team Joanna vs Team Claudia from 2016. 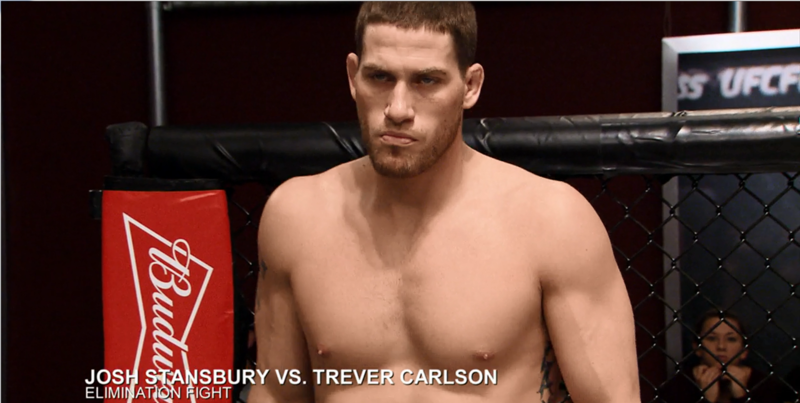 Josh Stansbury vs Trever Carlson TUF 23: Team Joanna vs Team Claudia Apr 20, 2016 (4:33) Josh Stansbury vs Trever Carlson from episode one of The Ultimate Fighter 23: Team Joanna vs Team Claudia from 2016. 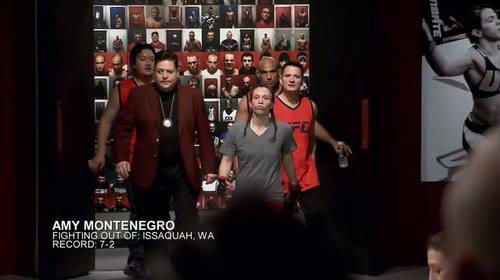 Helen Harper vs Amy Montenegro TUF 23: Team Joanna vs Team Claudia Apr 20, 2016 (3:56) Helen Harper vs Amy Montenegro from episode one of The Ultimate Fighter 23: Team Joanna vs Team Claudia from 2016. 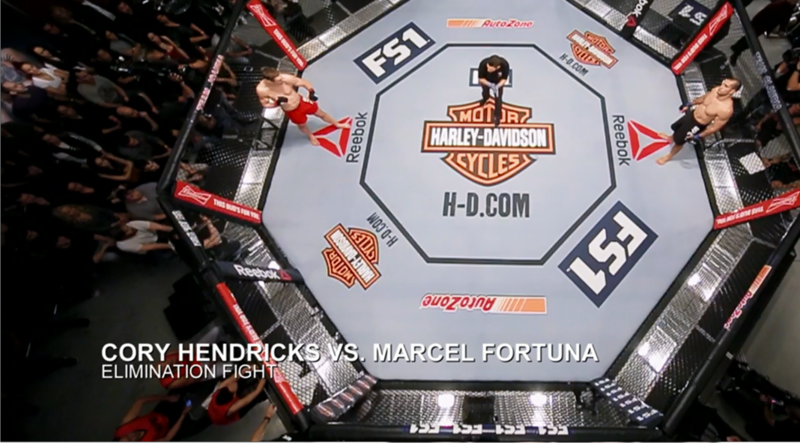 Cory Hendricks vs Marcel Fortuna TUF 23: Team Joanna vs Team Claudia Apr 20, 2016 (2:55) Cory Hendricks vs Marcel Fortuna from episode one of The Ultimate Fighter 23: Team Joanna vs Team Claudia from 2016. 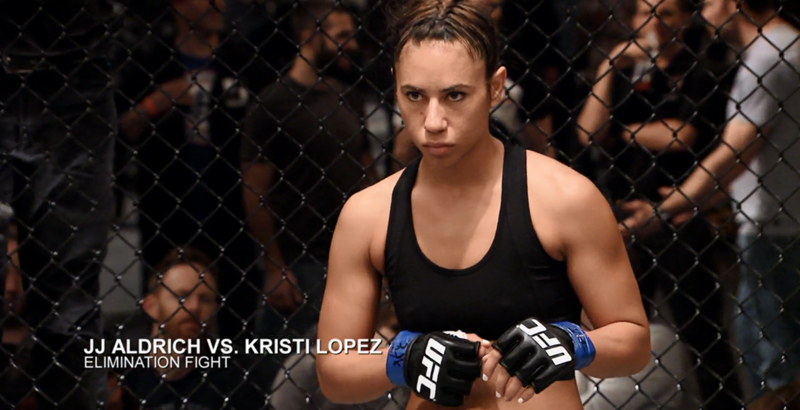 Kate Jackson vs Irene Cabello TUF 23: Team Joanna vs Team Claudia Apr 20, 2016 (0:54) Kate Jackson vs Irene Cabello from episode one of The Ultimate Fighter 23: Team Joanna vs Team Claudia from 2016. Andrew Sanchez vs Phil Hawes TUF 23: Team Joanna vs Team Claudia Apr 20, 2016 (3:08) Andrew Sanchez vs Phil Hawes from episode one of The Ultimate Fighter 23: Team Joanna vs Team Claudia from 2016. 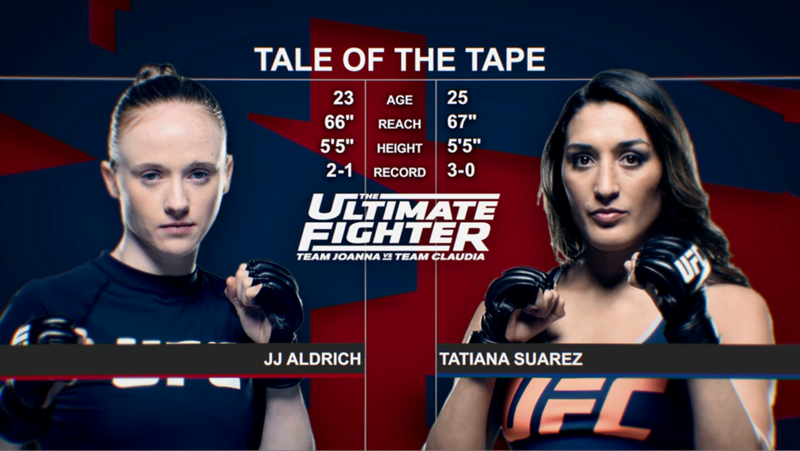 JJ Aldrich vs Kristi Lopez TUF 23: Team Joanna vs Team Claudia Apr 20, 2016 (0:18) JJ Aldrich vs Kristi Lopez from episode one of The Ultimate Fighter 23: Team Joanna vs Team Claudia from 2016. Elias Urbina IV vs Norman Paraisy TUF 23: Team Joanna vs Team Claudia Apr 20, 2016 (3:11) Elias Urbina IV vs Norman Paraisy from episode one of The Ultimate Fighter 23: Team Joanna vs Team Claudia from 2016.